Rear steer. It’s a term you’ve probably heard many times, and you may (or may not) really know what it means. In the most basic terms, rear steer is caused simply by movement of the rear suspension. When the rearend articulates, moving one wheel ahead of the other, the movement is translated through control arms to the chassis. If both of the wheels move fore or aft the same amount, the effect is not noticed and referred to as zero rear steer. Obviously, this has a limited effect on helping a car corner at race speeds on a dirt track. It is when one wheel moves fore or aft more than the other that cornering becomes easier or more difficult. The car’s handling in corners will become looser or tighter depending on the rear steer created by this movement. To help in our discussion, we reached out to legendary dirt track racer, race school instructor, and technical representative at AFCO Racing, Rex Merritt. Before we get too involved in the topic, a simple clarification is in order. We don’t want you to think that rear steer only applies to turning through the corner. Rear steer also affects the way a car handles coming out of the corner under hard acceleration. Picture a centerline down the middle of the car from nose to tail. Now, picture the thrust from the rearend to the right or left of this centerline. That is rear steer, and in dirt track racing, rear steer is very important. From left to right: Roll Oversteer, Roll Understeer, and Neutral Steer. Using the mental picture described previously, rear steer which creates a thrust angle to the left of the centerline will make a tight handling condition. That is to say that the car’s handling will be tighter on corner entry and on corner exit under acceleration. If the thrust angle is right of the centerline, the car will be loose on entry and on exit under acceleration. Being able to identify a loose or tight condition is the first step in using rear steer to help performance. Understanding what type of rear suspension, and how to adjust the suspension to dial in the amount of rear steering for different track conditions is the final part of rearend suspension tuning. The whole idea behind rear steer is to keep as much tire contact on the ground as possible during cornering. A smooth and fast corner entry is obviously going to lead to a faster corner exit. 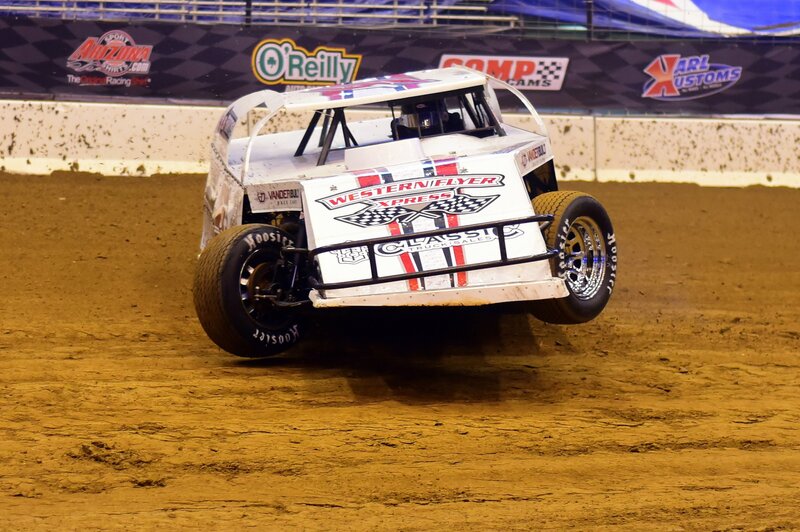 When the track conditions are muddy or tacky, drivers use the throttle to steer their cars and square off the corners, so little to zero rear steer is required. However, when the track sets up, turns hard, and has a lot of grip, cars often develop tight handling. The driver must break the rear tires loose to get the car to turn. In dry slick conditions, rear steer is dialed into the setup so the car rolls into, and turns sharper through the corner. With the right amount of rear steer for the conditions, the car has a more balanced setup, holds tighter lines, and does not require as much steering input. A loose or tight handling car can make for an exciting evening. Photo by Todd Boyd. Rear steer setup is dialed into the car as the track dries out and turns slick. For a starting point, the crew should follow the chassis manufacturer’s baseline setup instructions while adjusting one component at a time and take detailed notes. When dialing in rear steer and arriving at the desired setup, the moment of center (roll center) needs to be kept in mind. Moment of center determines how quickly and effectively the car transfers its weight from the left side to the right side of the car. For rear steer setup, the rear moment of center is adjusted more to the right to enhance traction. You need to be able to analyze the conditions and adjust the setup accordingly, so the moment of center is the ideal position for the prevailing track conditions. Keep in mind, suspension bars, springs, shocks, and roll bars all affect the transfer of weight, so moving the moment of center is a complex and detailed process. The length of the rear suspension arms play a critical role in weight transfer. The length of the rear suspension arms has an enormous impact on the lateral transfer of weight. The shorter the arms, the quicker the weight transfers from side to side, while the longer arms take more time to transfer weight. This has a big influence how quickly the car’s rear steer settings respond in a corner. In many instances, teams opt for shorter suspension bars to quickly transfer weight to the right rear wheel. Weight placement and moment of center also affect weight transfer on a car with rear steer setup. Track conditions can range from wet and sloppy, to very moist, black slick, dry and dry slick. The setup for wet and sloppy versus dry slick is on two polar opposite ends of the spectrum. For wet and sloppy, very moist, and black slick conditions, the car is in a loose handling state and can be steered with the throttle. A setup for a wet sloppy track typically uses a low ride height, with front spring rates set high. Rear spring rates are higher and shock valving is stiffer as well to maximum traction and improve handling. By contrast, the dry slick setup is completely different. The car exhibits tight handling, so the rearend is adjusted to enhance cornering. The front spring rate is high while the rear spring rate is low, so weight is quickly and effectively transferred to the rear for greater traction. With most setups, the left front has the stiffest spring and right rear the softest spring, so the rear right is loaded for maximum traction and the car transitions from tight to neutral handling. In addition, the ride height is often raised by an inch and shock valving is vastly softer. Spring rates handle the transfer of weight and the speed at which the weight is transferred. The setup is adjusted so the car rotates or rolls into the corners, gains traction on corner entry, and carries speed through the corners for faster lap times. As the left side of the car rises up and it rolls into the corner, the chassis needs to effectively transfer weight to the right rear, so the car gets maximum drive off of the corners. But at the same time, the other three corners need to be properly weighted so the setup is balanced and easy to drive. Finding the angle of the lower link. When trying to find the ideal setting, it’s better to start off with a small amount of rear steer and adjust more in, as needed. If there is not enough rear steer, the car will be tight, and if the rear steer is too extreme, the car will be loose. When the proper amount of rear steer is dialed-in, the driver can choose a line on corner entry and carry it through to exit without breaking traction. As the car exits the corner, the driver can get on the throttle earlier and carry speed down the straight, thus producing a faster lap time. On a four-link suspension, the suspension arms are adjusted so the rear-differential assembly is pulled forward on the left side and pushed back on the right side. The lower left rear control arm is adjusted to increase the amount of rear steer. By raising the link and increasing the angle of the rear-axle assembly, it will produce more rear steer, but you will also lose traction on that side, so the mechanic is seeking the best compromise. The setting on the upper left arm dictates the amount of drive on the left rear and traction out of the corner. Lowering the link decreases drive out of the corner, while raising the upper link improves acceleration out of the corner. Spring rates and shock valving also influence rear steer. Mechanics commonly go with softer rebound left-side shocks and softer compression right-side shocks. Weight is also moved over to the right side as much as possible for a more balanced side-to-side weight distribution. Increasing the arm angle on the right rear control arm also influences a rear steer setup. As you increase the angle, the drive for the right rear tire will improve. Decreasing the angle on the lower trailing arm will tend to tighten the car on entry and exit under loose conditions, while increasing angle will loosen the car up under tight conditions. There are limits to the amount of rear steer which you can run in a car. If too much rear steer angle is adjusted into the rear-axle assembly, the entire bird cage can bind up. In this scenario, you can bend suspension arms, break parts, or lose control. Driveshaft angle is another consideration. Pull bars and other links help control the speed and amount of driveshaft movement that is allowed. The driveshaft angle is also a consideration, and you can’t run too great of a driveshaft angle otherwise the U-joints will bind. Merritt says, “Your driveshaft is going to be your determining factor on how much roll steer you want to have. The wheelbase can change 4-inches when the car is dynamic. Also, the rearend will migrate to the left, which will put more load on the right rear tire. Extreme rear steer will lead to driveshaft binding. A swing arm Z-link setup. Graphic from AFCO Racing. A double-shock right rear setup. Graphic from AFCO Racing. Whether you are bluffing or not, carefully adjusting rear steer can be the difference between fast laps or fighting an ill-handling race car.